Vilsmeier-Haack reaction is one of the most important chemical reactions used for formylation of electron-rich arens. Even though Vilsmeier-Haack reaction was studied on a wide variety of hydrazones of enolizable ketones, literature lacks the examples of the use of 4-substituted cyclohexanones as a substrate. The cyclization potential of hydrazones of cyclic keto compounds is still interested topic of investigation. In the present study, the reaction of various hydrazines with 4-substituted cyclohexanones was proceeded and the resulted hydrazones in crude form were treated with Vilsmeier- Haack reagent using both conventional as well as microwave methods. The reaction of phenyl hydrazine with 4-phenylcyclohexanone yielded the corresponding tetrahydro-1H-carbazole instead of hydrazone during solvent evaporation at 40ºC. By keeping the temperature of water bath to 0ºC, the corresponding hydrazone was isolated in crude form which was immediate treated with POCl3/DMF for 10 min at 90ºC using microwave irradiation method afforded novel 4,5,6,7-tetrahydroindazole derivative. Using this optimized condition, the substrate scope for the synthesis of tetrahydroindazole derivatives was explored and synthesized total 6 final compounds. 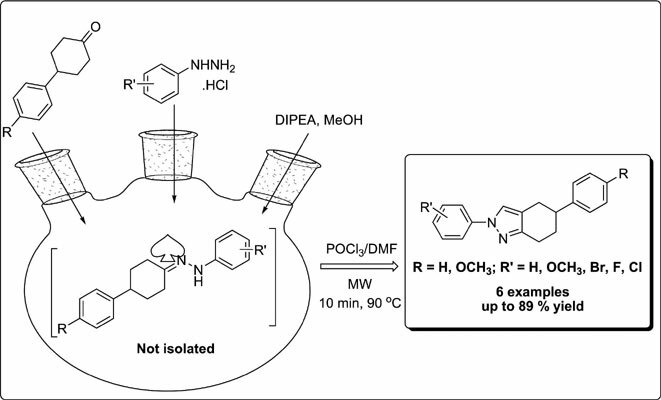 The microwave assisted synthesis of tetrahydroindazoles from 4-substituted cyclohexanones has been reported for the first time under mild conditions in good yield. Easy work up procedure, high yielding, shortened reaction times, clean and ecofriendly are the main advantages of this protocol. Tetrahydroindazoles, Vilsmeier-Haack reagents, microwave, halomethyleniminium salts, ketone, condensation.